Appearance fee: 10,000 Duff labels sent to Duff Brewery. What he presents to the honored Duff drinker: A giant, bottomless mug of Duff Extra Cold. His theme song: "Oh Yeah," by Yello. His assistants: Two Duff cheerleaders. His most handy accessory: A belt that holds eight cans of beer. 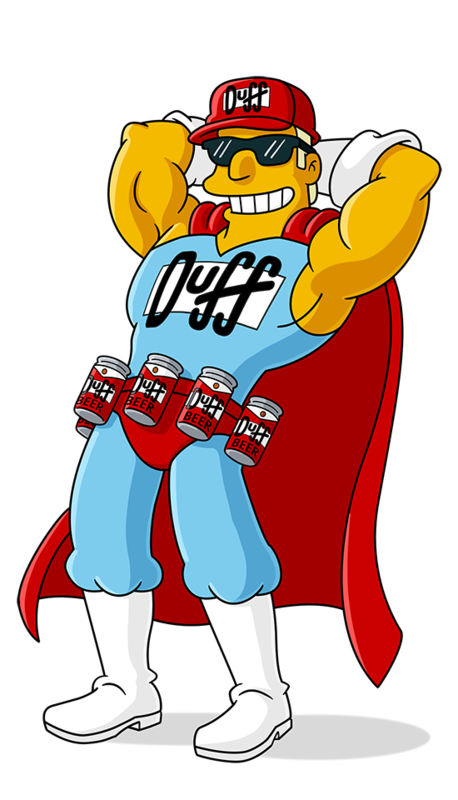 Mascot and spokesman for the Duff Beer company. Homer saddens Duffman causing him to quit, Homer gets a ticket. Oh yeah! Women, hear me pour! Oh yeah! Hey, Duff lovers! Does anyone in this bar love Duff?